Hurricane Sandy caused upward of $60 billion in damage, including an estimated $19 billion in damage and economic losses in New York City alone. Sea level rise played a relatively minor role in contributing to these losses. However, a new study finds that that might not be the case for future storms, even those that pack less of a punch than Sandy. The study, published Thursday in the Journal of Quaternary Science, also found that the record 13.88 foot storm tide Sandy brought to New York Harbor was driven more by the fact that the storm's strongest winds and peak surge arrived right as an astronomical high tide was peaking as well. "The timing of a hurricane's landfall with respect to high tides and the individual meteorological conditions of each storm (i.e. the storm surge) are the dominant factors in determining flood height," said Ben Horton, one of the study's co-authors, in an email conversation. "But the additional sea-level rise from 1788 and 1821 to Sandy in 2012 exaggerated and caused (more) flooding." Using marsh sediments from nearby Barnegat Bay, N.J., the researchers determined the relative sea level at The Battery at the southern tip of Manhattan rose by about 20.1 inches between a storm in 1788 and Hurricane Sandy. Of this increase, about 6 inches was due to the gradual settling of the land, which has been ongoing since the end of the last Ice Age, with the remainder being the result of global warming. The impact of sea level rise on storm surge flooding is similar to raising the floor of a basketball court. The higher the floor, the easier it is for players to dunk the ball, so that even shorter players will be able to dunk. However, the floor hasn't been raised that far yet. In an interview, co-author Andrew Kemp, who now teaches at Tufts University, said the 20-inch decrease in flood height if Sandy had struck in 1788 is a "pretty small number compared to how big a storm tide can be." But as oceans rise, more storms will be able to clear that bar with less help from tides. New York and other coastal cities will see more extensive flooding from weaker storms, while stronger storms will more easily set storm tide records. 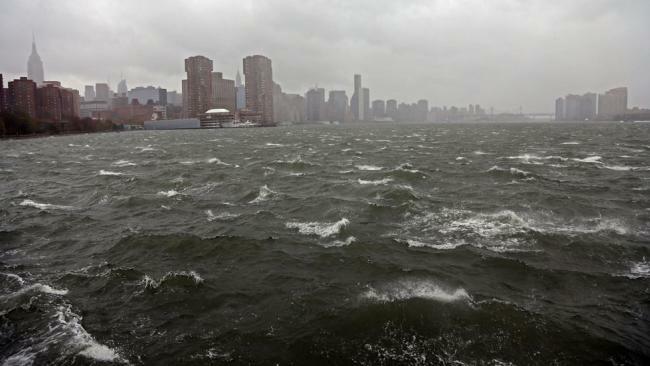 In June, a New York City climate panel reported that sea levels could rise at a faster rate than was forecast just a few years ago. New York Harbor could see up to 11 inches of sea level rise by the 2020s, and up to or more than 2.5 feet of sea level rise by the 2050s. "When it does happen . . . you're going to need smaller and smaller storms to overtop those thresholds as you go forward in time," Kemp said. According to revised flood maps from the Federal Emergency Management Agency, hundreds of thousands more New Yorkers have been placed in the 100-year floodplain compared to the maps that existed when Hurricane Sandy struck. With sea level rise, the city expects that up to one-quarter of all New York City's land area, with 800,000 residents, will be in the floodplain. "If we do nothing, more than 40 miles of our waterfront could see flooding on a regular basis, just during normal high tide," New York Mayor Michael Bloomberg said while rolling out the city's post-Sandy climate resilience plan in June. "We can think of these things as tipping points and sea level rise will cause them to be exceeded more often in the future because the baseline for hurricanes is raised and storms with smaller surges and not necessarily arriving on the highest tides will be able to overtop those physical structures," Horton said.